Next to the powers of heaven and hell, we are nothing. Tested by the gods, Leda and her angelic mate Nero venture into the City of Ashes, a fallen fortress in the Western Wilderness where nightmarish monsters reign supreme and an ancient secret is buried. To survive the Gods’ Trials, they will have to save the city—and they will have to do it without their magic. Their victory, however, comes at a heavy price. And the secret they uncover will upset the balance of power between Earth and heaven. 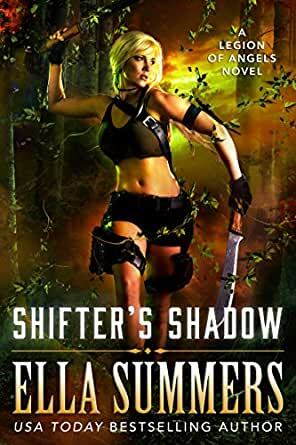 Shifter’s Shadow is the fifth book in the Legion of Angels series. Oh wow i loved shifter shadow, Leda is an incredible heroine and Nero omg their perfect for one another. And the twist ending is amazing. I never would have expected it but all good, i can't wait for the next book in this fantastic series. I started with this book in the series and didn't find it hard to understand where each character was at in the story line. However I feel the only thing that will keep me buying the books in this series is to find out how strong the main character within this story line will become. Yet to see if this 4 🌟 series will turn into a 5 🌟. 5.0 out of 5 starsAnother one please! Believe it or not, I didn't even realise this book had been released!!!! Love the main characters, so much sass & sarcasm! If only they would keep coming and never stop! For me this is up there with Kresley Cole & Nalini Singh! Can't wait for book 6!! I just love finding a new book in this series. The heroes are hot and feisty, the World they are a part of is fascinating and the story is a genuinely different take on Gods and Angels. Best to read from the first book of the series..
Another amazing instalment. The gradual evolution of this world and the growth of relationship is so satisfying. Highly recommend to any fans of fantasy romance. I've read all the books in the series is far. They keep getting better and better. The characters are so real and descriptive. The storyline is so inventive I am hoping that the series won't end until Leda or Pandora, the name Nero uses for her, reaches level 10 and becomes an angel or more.